Operation Albion was the codename for the German air, land and naval operation in October 1917 to occupy the West Estonian Archipelago, part of the Autonomous Governorate of Estonia, Russian Republic. 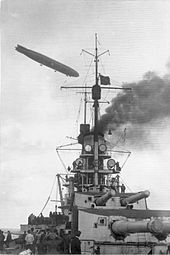 The land campaign opened with landings at the Tagalaht, Saaremaa on 12 October 1917, after extensive naval operations to clear mines and subdue coastal artillery batteries. The Germans secured the island by 16 October and the Russian Army evacuated Muhu on 20 October. Panorama of the Tagalaht Bay, Saaremaa, Estonia. This was the location of the German landing on 12 October 1917. German battleship Grosser Kurfürst photographed during Operation Albion in October 1917. Above is the Schütte-Lanz company naval airship S.L.20 (Type 'f'). After two failed attempts, the Germans landed on Hiiumaa on 12 October, capturing the island on the following day. The Russian Baltic Fleet had to withdraw from the Suur Strait after its losses at the Battle of Moon Sound. The Germans claimed 20,000 prisoners and 100 guns captured during Operation Albion from 12 to 20 October. At the beginning of World War I the islands were of little importance to Imperial Russia or Germany. After the revolutionary turmoil in Russia during the early part of 1917, the German high command believed capturing the islands would outflank Russian defences and lay Petrograd (St. Petersburg) vulnerable to attack. ^ Barrett 2008, p. 8. ^ Ernst Freiherr von Gagern, Der Krieg zur See 1914-1918: Der Krieg in der Ostsee Bd.3 (Frankfurt: Mittler &​ Sohn, 1964), Beilage 3. Barrett, M. B. (2008). Operation Albion: The German Conquest of the Baltic Islands. Bloomington, IN: Indiana University Press. ISBN 978-0-253-34969-9. Retrieved 24 March 2017. Wikimedia Commons has media related to Operation Albion.